Mary Pearl and Bud Lode have been football fans ever since their son Russell played the sport at Harlowton High and they followed him all over the territory. Recently, quiet Bud and vibrant Mary Pearl stopped at the editor’s house to sit for an interview en route to a Saturday ball game. The Lodes came to town to support their great nephew Daniel Barnhart who plays in the line for the home team. (The Engineers defeated White Sulphur Springs that night.) Mary Pearl loves basketball, but doesn’t get a chance to see a game very often these days. Bud isn’t that much of a booster for either sport but goes along for the ride and to get out of the house. The Lodes drove in from the Lode Ranch 15 miles northwest of Harlo. Bud’s ancestors on both sides came from Holland arriving in America between 1889 and 1893. His parents, Harry and Ida, lived first in a Dutch colony in Michigan where they met. They moved on to Park, South Dakota, where they were married. Then to Harlowton where they bought the first parcels of the present Lode property and raised Harold, Harim, Irene, Gertrude, Janette and Henry (Bud). Bud was born at the Lode Ranch and went to the Lode School (located a 3/4 mile from the ranch) through the 8th grade. Mother Lode was school clerk until its doors closed around 1963. Young Bud boarded in town when he attended Harlowton High with Axel Johnson, then Mrs. Ortwine. “I weighed 90 pounds when I started high school.” He graduated HHS in 1946 and went to work fulltime on the Ranch which had been his part-time occupation for many years as he helped his parents as they aged. During her first year in Harlowton, Mary Pearl taught Irene Lode Davis’s son in her class and got invited to Sunday dinner at the Davis home. She was thus introduced to Bud who drove her home after the meal in his new pickup. “I drove the Deep Creek Canyon a whole lot of times.” After a year at Helena, Mary Pearl took a job at Augusta, but was home in Power on weekends. Bud redirected his pickup to the northwest. Bud and Mary Pearl married in 1958 (51 years ago). Mary Pearl was a substitute teacher for a time at the Lode School filling in for Ruby Lammers (mother of John Lammers). “She took that first December off and I got to do the Christmas program.” And, the next year she did the same. By the mid 50s, Bud’s parents had moved to Harlowton and Bud took care of the ranch by himself. The Lodes eventually purchased the properties that Harry’s three brothers had owned since 1915. By the mid 60s, the Lodes began custom haystacking for Pete White. Bud bought a Farmhand and brought in extra income with the help of a hired hand. Eventually, the Lodes got another Farmhand which Mary Pearl and the kids ran. Business came from small irrigation farms and the Winnecook. The Lodes have three children: Russell who with his wife Bonnie runs the Lode Ranch these days, David who is a salesman in Portland, OR, and Mary (Dolly) who ranches between Harlo and Melville. The Lodes have two grandchildren and two great grandchildren. In the late 60s while raising the family, Mrs. Lode taught kindergarten and music at the Two Dot and Shawmut Schools. For 21 years, Mary Pearl conducted Play Skool at the Federated Church. Two sessions a day on Mondays and Wednesdays during the school year. 3-4 year-olds in the mornings and 4-5 year-olds in the afternoons sat with Mrs. Lode. What began as a play group to help youngsters socialize before going to school became Harlowton’s PreSchool program for over two decades. Music, music, and more music became an intertwining thread for Mr. and Mrs. Lode as they grew up, married and matured. Bud was introduced to piano in his early teens by his eventual sister-in-law. Helen Tucker, a Lode School teacher, planned a basket social and auction to raise money to buy a piano. The social was such a success that Helen also got herself a Lode husband. Harim was smitten enough to make a big bid for Helen’s basket, help the school to purchase a piano, and make points in procuring his wife. Irene taught at the Langston School where Bud eventually started to perform for the public at Saturday socials. Soon, he was playing mandolin as well as accordion for country dances with Art Schanke on fiddle and Mrs. Dewey on piano. Later, his partners were Mr. and Mrs. Myers, drums and piano. Still later, Iverson and the Buccaneers, and Ballantine. “I spent a lot of time practicing. There wasn’t much else to do.” Accordion and guitar eventually became Bud Lode’s instruments. Mary Pearl and Bud both played with the Musselshell Mudcats from the 60s. 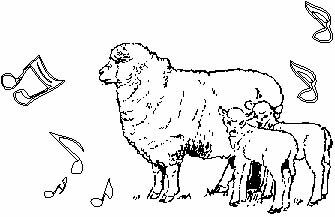 But, Bud often was drawn away for lambing in the spring - especially as their flock grew in numbers - and couldn’t join the group. trumpet, Jim Berg also on trumpet, Marvin Berg drums, George Volseth on saxaphone, and others too numerous to mention. Bud had a big birthday party on July 19 to celebrate his 80th. Over 100 people attended and friends Julie and Lynn Sanders from Big Timber provided musical entertainment. While Bud Lode will never be a big sports fan, he still keeps a hand in music. Mary Pearl and he go to the Wheatland Memorial Nursing Home the first Sunday of the month to entertain the residents. Bud sings and strums the guitar and Mary Pearl plays piano. They occasionally do the same at nursing homes in Big Timber, Lewistown and Billings.